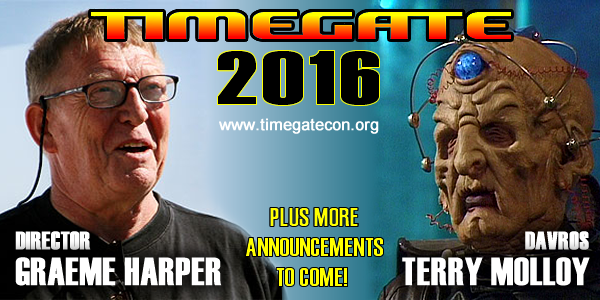 As we wind down from a very successful 2015 (our largest attendance ever) we’re already gearing up for 2016, and we have our first two guest announcements: Director GRAEME HARPER and TERRY “Davros” MOLLOY! Mr. Harper’s involvement in Doctor Who stretches from him being in the studio as a very young intern when Patrick Troughton was filming his very first story, “Power of the Daleks”, to becoming one of the power directors at the BBC. He worked heavily during the Pertwee and Tom Baker eras of the show and then directed Peter Davison and Colin Baker. He returned to the show in 2006 to direct David Tennant in 13 episodes, winning a BAFTA Award in the process. Mr. Molloy, as you’ll know, is the Davros of the 80s. He worked with Peter Davison, Colin Baker and Sylvester McCoy on television. He has reprised his iconic role in numerous Big Finish Productions. He’s also played Davros in the 2005 stage play “The Trial of Davros”. Website updates will continue over the next couple of days. We’ll announce as soon as online sales for admission to TG’16 will be available.